Or: here is my reminder that our betters, the MOTU, and their eager servants in the political class never, ever rest from their quest to enrich (themselves) and immiserate (anyone it takes). “Turn your car title into holiday cash,” TitleMax, a large title lender, declares in a recent television commercial, showing a Christmas stocking overflowing with money. More than 1.1 million households in the United States used auto title loans in 2013, according to a survey by the Federal Deposit Insurance Corporation — the first time the agency has included the loans in its annual survey. Title loans are becoming an increasingly prevalent form of high-cost, short-term credit in subprime finance, as regulators in a number of states crack down on payday loans. For many borrowers, title loans, also sometimes known as motor-vehicle equity lines of credit or title pawns, are having ruinous financial consequences, causing owners to lose their vehicles and plunging them further into debt. A review by The New York Times of more than three dozen loan agreements found that after factoring in various fees, the effective interest rates ranged from nearly 80 percent to more than 500 percent. While some loans come with terms of 30 days, many borrowers, unable to pay the full loan and interest payments, say that they are forced to renew the loans at the end of each month, incurring a new round of fees. …lenders make the loan based on an assessment of a used car’s resale value, not on a borrower’s ability to repay that money, many people find that they are struggling to keep up almost as soon as they drive off with the cash. As a result, roughly one in every six borrowers who take out title loans have their cars repossessed, according to an analysis of 561 title loans by the Center for Responsible Lending, a nonprofit in Durham, N.C. The high interest rates on the loans have enticed an influx of Wall Street money. Private equity firms are investing in lenders, and some big banks are ramping up their auto lending to people with blemished credit. for every state where there has been a crackdown, there are more where the industry has mobilized to beat back regulations. In Wisconsin, it took the title loan industry only one year to reverse a ban on the loans that had been put in place in 2010. In New Hampshire in 2008, state legislators enacted a law that put a 36 percent ceiling on the rates that title lenders could charge. Four years later, though, lobbyists for the industry won a repeal of the law. 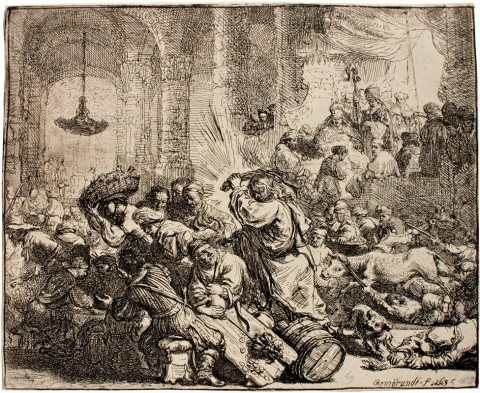 Image: Rembrandt van Rijn, Jesus driving the money-changers from the Temple, 1635.